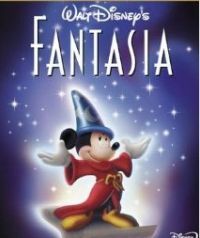 The Sorcerer’s Apprentice was, at one time, an animated chapter of the Disney film, Fantasia. Volumes have been written about the possible underground, unconscious meanings of the segment. As a reminder, Mickey Mouse, the titular character, uses magic to accomplish some mundane tasks. He animates some brooms, mops, and so on to clean the laboratory, and quickly the whole enterprise spins out of control. Herbert West would have reminded Mickey not to animate anything more powerful than himself, anything he could not dismiss. Herbert West was an H.P. Lovecraft character in the business of acquiring the bones of old sorcerers, raising them back to life, interrogating them for their secrets, and then destroying them once again. He unfortunately raised an ancestor who looked sufficiently like himself that when the ancestor killed him and stole his identity, nobody really noticed. Mickey didn’t bring up anything so terrible as a homicidal proto-Mickey. Just some brooms. But Disney decided to turn the animated segment into a feature film, resulting in 2010’s The Sorcerer’s Apprentice starring Nicolas Cage. Here we get a peak at the unconscious mass underlying the out of control brooms and mops, and it isn’t pretty. The film has a deep problem with otherness. That’s the unstated theme of the whole endeavor. First, the only Black character only has two or three speaking lines. He’s a mugger. One of the White protagonists describes him as “huge” even though he’s not obviously gigantic. Michael Brown’s killer described him as huge, too, even though he was only the same size as his shooter. So, one Black man in the movie and he’s a huge mugger. There is a Chinese sorcerer in the movie, too. He appears for just about six minutes and controls a dragon. He’s half-naked, says nothing at all, and is depicted as savage. The main characters encounter him in Chinatown for no obvious reason, where a parade is taking place featuring a paper Chinese dragon. It always seems to be Chinese New Year in Chinatown in movies like this. It plays up the exotic and oriental, the mystifying and inscrutable, casting the Chinese onlookers into otherness. Even the main protagonist, a boy who likes physics, gets the stereotyping treatment. Because he likes physics, he is therefore socially awkward, fit company for Sheldon Cooper on The Big Bang Theory. Hollywood doesn’t have a great track record when it comes to managing diversity. Strong female roles are hard to come by. People of color tend to be sidelined. Even among the privileged classes of actors, impossible beauty is required. The Sorcerer’s Apprentice epitomizes Hollywood’s problems with diversity. The brooms and mops are whipping around the lab, scrubbing everything clean, obsessively and desperately trying to sanitize the otherness out of the area. If not out of the movie then at least out of consciousness.